Pioneers in the industry, we offer heart shape mousepad sublimation heart shape mouse pads, round shape mousepad sublimation round shape mouse pads, sublimation mouse pad roll - blank mousepad roll and sublimation mouse pads from India. 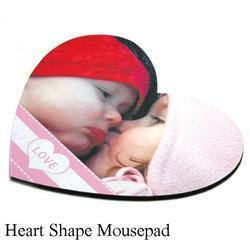 We are one of the reputed enterprises in this industry, offering a wide gamut of Heart Shape Mouse pad. Our provided mouse pad is manufactured with high grade material by our workforce. The given mouse pad is very useful computer accessory and increase life of mouse. The mouse pad offered by us comes with fine Fabric Surface and hence delivers good transfer results. We also entertain bulk printing orders. 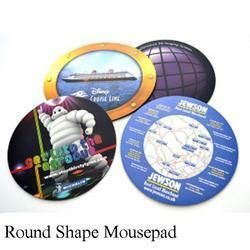 With the valuable assistance of skilled team of professionals, we are offering an extensive range of Round Shape Mouse pad. Our mouse pads are precisely are meant to provide smooth surface to mouse and can be printed with logo and designs that make them perfect items for gift during promotional events. Offered mouse pads are checked in terms of quality so as to supply a defect free range. As well, these mouse pads are comes on assorted sizes & designs as per the requirements of customers. Owing to our state-of-art manufacturing unit and cutting edge technology, we are offering quality assured Sublimation Mouse Pad Rolls. These products can be used for different applications like table mats, mouse pads & wrist band. 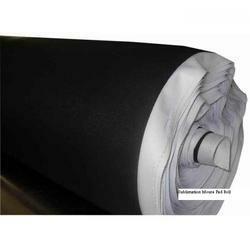 We supply best quality mouse pad roll which delivers good quality results. In addition, our products undergo various tests by our quality experts, so as to assure its defect free range. 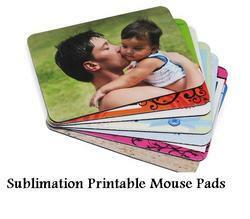 Another big time selling prodct offered by Koncept Sublimation is Sublimation Mouse Pads. These products are high in demand because of its unility and personalization options. These Mouse Pads ate having equal pull in Retails and Corporate as well. These Mouse Pads can be used as brand Promotional Promotions and Persoanl use as well. Looking for Sublimation Rubber Products ?